There are many examples of tremendously effective mentoring programs sprouting up all around the country. 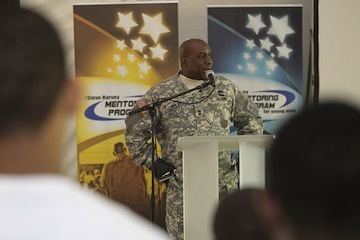 For those interested in mentoring events in Dallas, check out the recent Steve Harvey Mentoring Program for Young Men. Steve Harvey is a well known comedian, author, television host, and radio host, but many people may not realize that he would not be who he is today without the mentors that he had along the way. For this reason, he is passionate about mentoring the younger generation and hosted his 5th annual national Steve Harvey Mentoring Program for Young Men in Dallas the week of June 11-16th. Coincidentally, this event was held over Father’s Day weekend, and Harvey put on this mentoring event to reach 100 young men that do not have a father figure in their lives. Participants took part in physical challenges with the U.S. Army, sport segments such as golf, baseball, football, and basketball, fishing with the U.S. Fish and Wildlife Service, and discuss important topics pertaining to the sports industry, education, personal image, relationships, and what it takes to be a man. Motivational speakers in addition to Harvey included Dr. Steve Perry, Dr. Marvin Thompson, Deion Sanders, and several other special guests. To learn more about upcoming mentoring events in Dallas, please contact us at the Over My Shoulder Foundation.